The subtle sweetness combined with spicy ginger is a perfect "it's spring and almost summer drink!" although it can truly be enjoyed year round. This sweet nectar will instantly transport you to the islands. Our recipe uses pineapple skin which is normally thrown away and not put to good use. It is a creative non alcoholic drink but you can certainly add your favorite rum and serve up as a cocktail drink. Make "pineapple ice"by freezing pineapple chunks. To make it easy, use a plastic or glass container lined with parchment paper and lay chunks spread apart so chunks do not stick together. Bring 3 cups water to a boil in a medium saucepan over high heat. 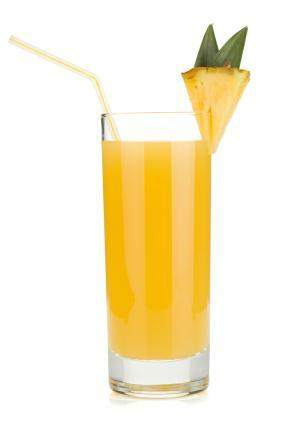 Place pineapple peel, JCS Instant Ginger Tea and cloves (optional) into a large glass pitcher or bowl. Pour boiling water into pitcher and stir. Allow to cool down to room temperature (best results if left overnight). Strain the liquid. Serve over ice and "pineapple ice".